With 1 billion Instagram users, it’s hard to know who to follow on Instagram. However, fear not! Because we’ll help you figure out exactly who to follow. Of course, the simplest place to start is to follow your friends and family on Instagram. You can simply ask for their username or you can link your Instagram with Facebook. Therefore, you can find all your Facebook friends on Instagram so you can follow them all. Instagram is a great platform to share pictures and videos with your friends and family. It gives them a little glimpse into what you do in your daily life. 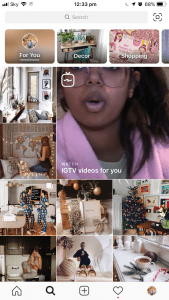 With the 24 hour Instagram stories and the new option to share stories with close friends only, the app is definitely catering to groups of friends. In fact, you can also create group chats on Instagram messenger so you can have exclusive conversations with your siblings, favorite cousins or your squad. So, if you’re wondering who to follow on Instagram, friends and family is the best place to start. It wouldn’t be a good Instagram experience if you didn’t follow your favorite celebrities. Most celebrities are active on Instagram as it’s a great, fun and creative way to break the fourth wall with fans! Find your favorite celebrities, follow on Instagram and keep up to date with the behind-the-scenes of their famous lifestyle. Some of the most followed Instagram accounts are Cristiano Renaldo, Selena Gomez and Ariana Grande. Not only is it fun to stalk celebrities’ Instagrams, but you can also get a lot of good tips for your own Instagram account. Whether that’s from their theme, captions or stories, these celebrities are playing their Instagram game very well! In fact, they have hundreds of millions of followers. Definitely go ahead and follow on Instagram for a bigger sneak peek into their lives and some top Instagram tips! As well as the big celebrities, you can follow your favorite indie artists or bloggers. If someone has an audience of any kind, they’ll surely be on Instagram to promote themselves. So whether you are a fan of indie artists like Kina Grannis or successful travel bloggers like Linda Voltaire, you can follow on Instagram for extra updates! new video up today! i covered “colorblind” by the counting crows and it felt so good 😭 . link in bio to watch the full video, and stay tuned to the end for a bit of post-song rambling and some fun mental health talk 😉 . happy friday, friends!how’s your brain doing? Now that we’ve covered the basics, let’s talk about more niche accounts. Perhaps you’ve started your Instagram account with the sole purpose to find specific accounts. In fact, it’s very easy to do that! Instagram is a place of community. Where people share common passions, they band together to share them. The easiest way to find these accounts is through hashtags. No matter what kind of photos you’re looking for, there is a hashtag for it. Through the hashtag, you’ll find accounts that dedicate themselves to certain categories. From those accounts, you can find similar accounts through theirs. First, search for a hashtag. When you search a hashtag, just type in the keyword and a bunch of hashtags will come up. For example, let’s use the topic of food and recipes. 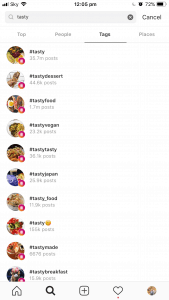 If you want new food ideas, Instagram is the place to be! 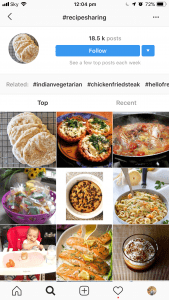 In your search bar, type in ‘Recipe’ and click Hashtag. You’ll see how many results appear! For sure, you can choose any of these and thousands of photos will appear. I chose to check out #recipesharing as it seemed most relevant to getting new recipes. Certainly, there are a lot of great images here to choose from! Click any, check out their post and perhaps follow their account for more updates. 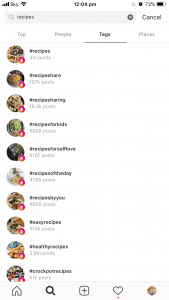 In fact, you can follow the hashtag and get all the updates you’ll ever need from the hashtag #recipesharing which will result in finding the perfect accounts for you to follow! This account shares their ingredients in the caption of their photos. Of course, this is a super useful and easy way to get cooking yummy food! Next tip: you can find similar accounts straight from a new discovery of an account. This little blue down arrow is your new best friend. Click it and you’ll be introduced to a ton of new similar accounts! Keep doing this on repeat to find new accounts under the same category. If you’re looking for something more specific, try a food-related word when searching for hashtags. For example, I tried #tasty and a bunch of options appeared. In fact, this led to me a multitude of perfect accounts to find recipes. They share quick videos from different accounts. All videos show a new easy recipe! Having said all that, this is the best way to discover who to follow on Instagram. 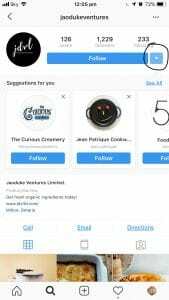 You can use this hack with any topic: food, beauty, travel, books, movies, home decor and more. We’ll give you some starting points on a bunch of topics to get you started. However, if you’re not sure where to start, don’t worry! Instagram is a big place and it can be daunting, but Upleap can help. They will help you find your place on Instagram, build your brand and connect you with real people. Click here to start your free trial now. Instagram is a great place to go for travel tips and inspiration. We have a few ideas of who you can follow on Instagram in this category. @travelandleisure is a great travel Instagram account with 3.7 million followers. They share their audience’s pictures. In fact, they always tag the location so you never miss out on your next holiday booking! They credit the original photographer in all their photos. In fact, you can click their username and discover even more travel Instagrammers this way! This specific photo leads to @mattvanswol who posts a lot of travel photographs on his own account. Start with big travel Instagram accounts to discover more hidden gems. Next, we’ll cover home decor. After Pinterest, Instagram is the hub of DIY and decorating ideas. There are millions of accounts that dedicate themselves to sharing photos of their homes. For some, their home is their art. They create and design it exactly the way they want to display it. We’ll give you some accounts to follow on Instagram if you’re looking for the perfect home inspo. We found @pomponetti through the hashtag #hyggehome. She posts gorgeous photos of her bright white cozy home that she shares with her husband and four kids. From there, you can find a bunch of beautiful home decor shops on Instagram. @pomponetti tagged @housedoctordk in her photo. They run an Instagram account for their home decor website where they sell everything from lamps to fireplaces! Instagram is the ideal spot for fashion bloggers and models. With the prominently visual aspect of the app, you can find millions of fashionistas to follow on Instagram. In fact, forget society’s stereotypes on what a model can be. Instagram promotes diverse models. Krystal Stroud is a confident, beautiful, plus size model. Of course, sharing body positivity on social media is super important. If you’re looking for fashion divas to follow on Instagram, Krystal is a great place to start. From her account, you can find shops that she tags in her photos. In fact, she tags other welcoming brands that share her passion for body positivity. For example, she partnered with the brand @swimsuitsforall which, well, make swimsuits for all! Flirty, feminine and fresh, these statement-making suits are waiting for you! Click the link in bio to shop. Once you start following your favorite accounts, Instagram will actually recommend you similar accounts on your explore feed. They use their algorithm to calculate the type of content you want to see. You can even search it by category as seen along the top of the page, such as decor, shopping, fashion, travel and more. You’ll never be at a loss for who to follow on Instagram. Use our great tips to discover your new online community!